Headquartered in Paris, France and operating in more than 30 countries, Capgemini is a global consultancy that treats its blue-chip clients as collaborative partners. 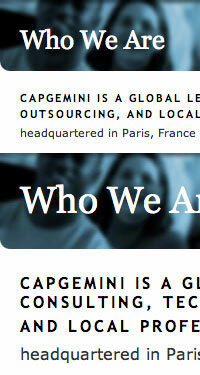 Many companies talk about that kind of partnership, but Capgemini actually means it. 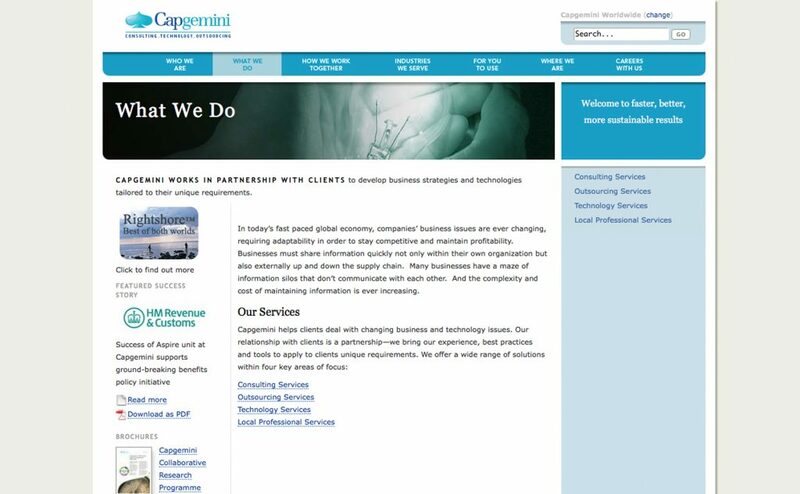 Capgemini is a global leader in consulting, technology, outsourcing, and local services. 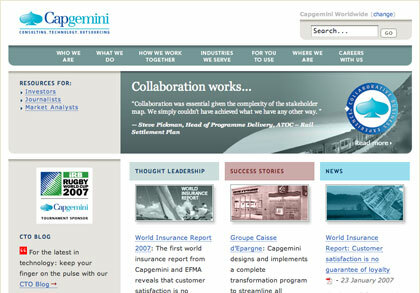 Working in tandem with Stopdesign, we redesigned Capgemini’s site to reflect the company’s commitment to collaborative partnership. Collaborative partnership was key to the company’s rebranding; we took this idea to every level of the site. Reflecting collaborative partnership meant preferring natural language to buzzwords and consultant-speak—easy to spot in something as basic as the navigation menu. Instead of categories based on corporate structures and sales divisions, we used clear, ordinary language to connect the visitor’s needs to the company’s services. A plain-talking navigation bar. Clear, natural language instead of the usual buzzwords. In place of the heinous drop-down menus that users hate (but were somewhat expected at the time of the design), our information architecture introduced something we called spectrum navigation. You can see it in the screenshot, and view it in action on this archived Automotive page. As content becomes more granular, sidebar hues reflect the depth of the path as the visitor explores more deeply into specific topics. Like spark-lines and progress bars, our innovative navigation helps visitors form a mental model of the site’s architecture and track their location within it. Subnav Shading conveys subject depth. While the spectrum lets visitors drill up or down with a click, sibling linkage is handled contextually. The combination of spectrum navigation and contextual linkage is featured in the main content area of each page, replacing the previous site’s tedious and poorly usable drop-down menu structure. As type size increases, so does container for header graphic, showing more of the image. Human-friendly information architecture and design are all well and good, but what happens when marketing begins to fill the site with copy? We created strict content guidelines to help Capgemini’s in-house staff find and eliminate vagueness and buzzwords, replacing them with informal, yet businesslike, language that reinforces the company’s emphasis on true collaborative partnership. Last but not least, we designed and built a powerful and versatile custom content management system for the new site. Powered by PHP and housed on low-cost, reliable Unix servers, the system did everything a modern CMS should do. It included such niceties as contextual help, and supported the site’s sophisticated use of web standards. Brian Alvey designed the custom back-end system. We, along with Stopdesign, conducted research, information architecture; graphic design; user interface design; user experience design; editorial consulting; content guideline development; content strategy; writing; editing; style guide development; CSS/HTML template development. Launched 17 May 2005. 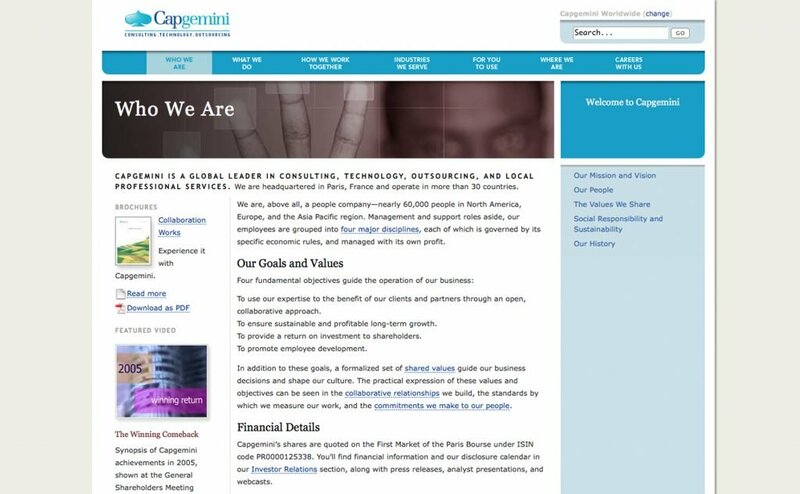 Needless to say, Capgemini has redesigned several times since then, but you can get a partial glimpse of our beautiful work by visiting the archived site. 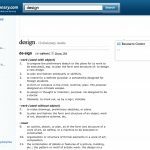 Previous: A style guide 15 years ahead of its time: New York Public Library Next: Design is a verb: Redefining Dictionary.com.